You will be given a reference e-book to read which has 296 pages And the test will be based on that e-book , you can take final test within 1 year of purchase. Also known as corporate ethics, business ethics refers to a kind of professional or applied ethics which works by examining the ethical or moral problems and the ethical principles that form part of the business environment. You can expect this to be applied in various aspects linked to business conduct and is extremely essential in examining the conduct of individuals who form part of a business group and a business organization. It should be noted that business ethics comes with descriptive and normative dimensions. Descriptive methods are said to be employed by academics that plan to fully understand business behavior while normative methods are often used in career specialization and corporate practice. It is also important for you to note that the quantity and range of business ethical issues are capable of reflecting how profit-maximizing behaviors interact with concerns that are known for being non-economic. Business ethics is also defined by a lot of experts as behaviors adhered by different types of business organization as a means to improving their daily activities within the industry. Note that the ethics run by a specific business organization have the tendency of going diverse. It is also important for you to know that business ethics is a huge help in applying the manner through which business organizations should interact with huge industries worldwide but also on how their people should personally and effectively deal with a single customer. Acting by adhering to business ethics can help you distinguish what is right from wrong and formulate the best business decision. If you intend to become a business ethics expert, then be aware that you can easily reach this aim with the presence of a well-recognized and highly reliable online certification company called Brainmeasures which is now capable of offering an impressive business ethics certification course. What makes this business ethics course from Brainmeasures truly remarkable is the fact that it is proven to be really effective in explaining to you how you should behave once you start to run your own business. It gives you the chance to undergo an informative business ethics training which is a huge help when attempting to completely understand how business ethics works, the different ethical business standards that you need to follow when you are running a business, the most common business principles that you should consider following, the best techniques that you can use in making sure that your business continues to operate based on the most ethical business standards and ensuring that your people adheres to these standards as well. 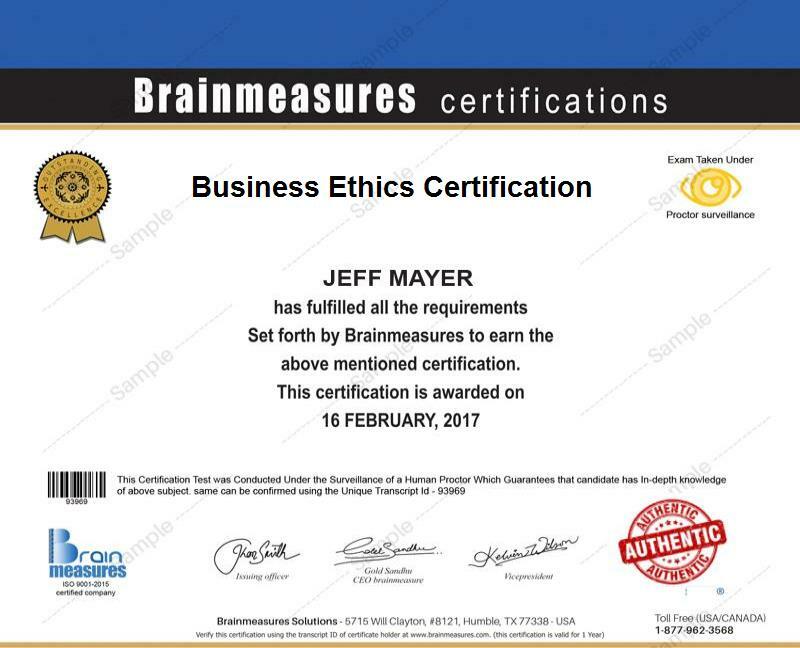 Holding the business ethics certificate which is provided by Brainmeasures to those who have completed the business ethics course can help show your expertise in the field. How to reconsider ethical approaches relevant to moral reasoning? How to reconsider the effective management of business ethics? How to motivate the people who are part of your organization to strictly adhere to essential business ethics? Anyone who is now a part of the business industry can greatly benefit from the business ethics certification program which you can now access at Brainmeasures. You can expect this certification program to be a major help for all existing and aspiring business managers and supervisors, ethics and compliance officers, risk management executives, general counsels and all other professionals whose responsibility involve ethics and compliance. Working as a certified professional after you complete your business ethics certification course is also a huge help in enjoying a significant increase in your income. Your business ethics certification can be expected to help you get the position of a business ethics manager which lets you receive around $52,000 to $112,000 annually. Working as a business ethics consultant after receiving your certification also entitles you to earn around $85,000 to $151,000 yearly.